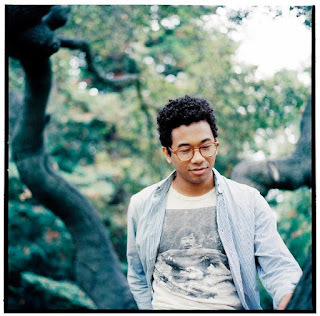 Chaz Budwick of Toro Y Moi (which roughly translates to "Bull and Me" using both Spanish and French) released his third studio album a few weeks ago, Anything In Return. With a background playing punk and indie rock, Bundwick found his voice as a solo artist while studying graphic design at the University of South Carolina. Taking far reaching influences from French house to Beach Boy Brian Wilson's pop to 80s R&B and hip hop, Bundwick started the chillwave genre with classmate Ernest Greene of Washed Out after graduation in 2009. Along with two studio albums, 2010's Causers of This and 2011's Underneath the Pine, Bundwick has created many singles, remixes and a dance music side project called Les Sins with Dan Snaith of Caribou. He appeared yesterday on KCRW as part of their new "In Studio HD" sessions on "Morning Becomes Eclectic," with his touring band. (Toro Y Moi has two tour dates in NYC this week, check list at the end of the post.) Listen at this link here or watch below, which is especially enlightening with a band like Toro Y Moi to see who's doing what, with their layered mix of tripping sounds and playing instruments. There is no studio audience, and of course this being radio they just have themselves to play for, but really interactions between band members are always interesting to watch, no matter what the setting. They begin with "Rose Quartz," a song I've already picked for my next new music playlist, which juxtaposes quirky synth samples over a thumping drum beat (and that's just the introduction!) With the new HD video, things get a bit too up close and personal with KCRW's Musical Director Jason Bentley, but the info from the chat from these two sitting feet apart is telling. Budwick explains how most his songwriting is done wherever he happens to be on his laptop -- from a recent move to California, to stops on a world tour which included New Zealand. "To be able to work as much as possible is fun for me," Budwick says in his laid back style. He even finds time to indulge in his artistic side by drawing doodles, go figure.